2013 marks the 50th anniversary of the inauguration of the Tour Dents du Midi, the walking route that encircles one of Switzerland’s best-known mountain ranges, adjacent to its border with France. For that reason, yesterday’s annual trail race around the seven jagged peaks that make up the Dents du Midi held special significance. With or without this historic marker, however, the “Trail DM” is one of the most enjoyable trail events I’ve done in Switzerland this season. Gustave Courbet’s 1874 painting “Château de Chillon” has been credited with spurring tourism to the Dents du Midi, shown in the background. The castle, meanwhile, has been credited with inspiring Mary Shelley to write the novel, Frankenstein. How to sum up this race? Well, the Trail DM is a little bit of everything. Not corporate and big-time like some of the other Alp trail races. But, it’s much more than a community trail race, like some of its cousins in the Valais canton. It defies easy categorization. Then, I remembered the tourism motto of Champéry: Sport, charme et authenticite. 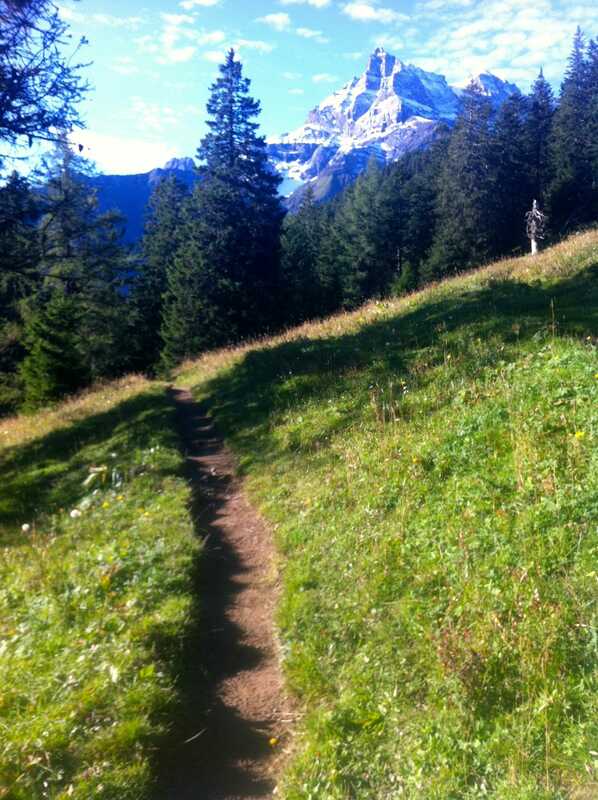 Unlike a lot of marketing hype, the saying rings true for Champéry, and also for the Trail DM. Sport? Any event that starts at 6 am in the morning, is 55 km long and has 4,733 meters of climbing… well, it’s definitely sport. In fact, “sport” in this case feels like a classic British understatement, akin to calling the Eigerwand, “a trifle challenging.” Charming? Absolutely. Trail DM still feels like a local event, yet it has a reach that is international in scope. It attracts many Valais Canton residents, and most if not all of the volunteers are from villages that lie in the shadows of the range. It’s imbued with a friendly vibe that’s hard not to like. And authencité? 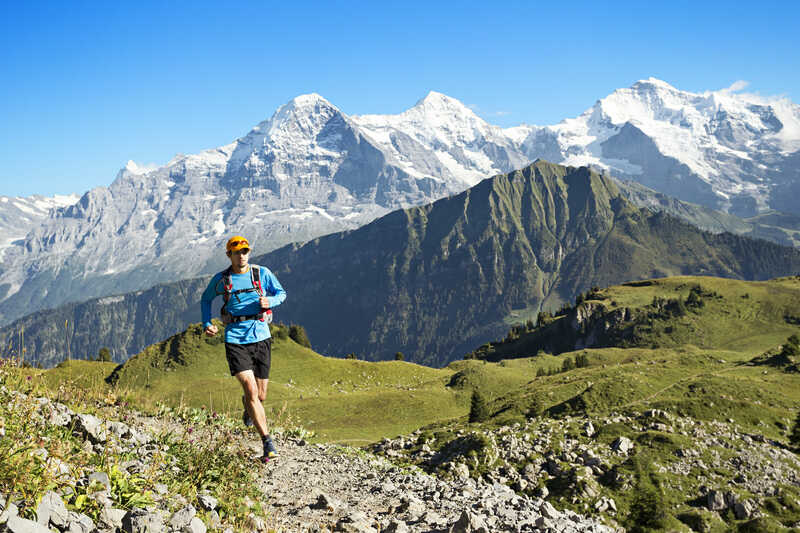 Well, the race around the Dents du Midi was one of the original trail races in Switzerland. The Swiss military used to accomplish the route—traditionally done over three days by hikers–in an epic one-day push as a training mission. After a lapse of a number of years, the race is back and if yesterday’s enthusiasm was any indication, it’s safe to say it’s here to stay. Rue Village, Champéry: Good morning everyone! Ready to run for, say, nine hours? What was the race like? For what I look for in a trail race, it gets high marks. A morning climb led to high-elevation cruising through Alp pastures, past huts and farms—at one point even literally playing slalom with a few sheep. Seeing the sunrise over neighboring peaks after an uphill run, lit only by a flowing river of headlamps and a bright night sky, is a memory I’ll not soon forget. The route was no pushover, either. In particular, the challenge posed by Col Jorat shouldn’t be underestimated. Coming more than halfway through the race, it includes 1,670 meters of climbing. The faces on runners nearing the last steps of the climb all seemed to hold a plaintive, Please let this end soon look. Fortunately, an aid station at Auberge Salanfe is only about 15 minutes downhill, after topping out at the Col. Mostly, though, Trail DM was wild—one of the most rugged, remote and alpine-feeling races I’ve done this season. With four aid stations over the length of the course, Trail DM doesn’t pamper its runners, like other Swiss mountain races. You’re largely on your own. Manage hydration and food accordingly. For me, the day ran the gamut, but only because I wasn’t sufficiently trained for this distance, having run a combination of easier mountain marathons this summer, and shorter trail races. I had what was a downright gleeful first half, followed by a full-on crash and burn headed up to Col Jorat. Lesson learned. On the agenda for next year? More hours in the mountains. With more vertical. On the way to Vérossaz, the halfway mark. A nice morning to be out for a run! A confession. I’m a little biased in all this. I’m partial to the Val D’illiez—the valley below much of the Dents du Midi range. My aunt and uncle have spent summers in the village of Troistorrents for nearly 50 years. The area has all of the great outdoor recreation of the rest of the Alps, but has managed to avoid becoming an overcrowded tourist trap. It’s low-key, friendly, and—thanks to the AOMC cog railway—easy to get around, too. Oh, there was another race going in Switzerland the same day as the Trail DM. Something about a young lady, or Jungfrau, over Interlaken way. In fact, I had signed up for it. But given the choice between a hugely commercial event with thousands of runners, and a tough, wild, mountain run, the Trail DM was the obvious call. Besides: who wants to run on a dozen miles of tarmac, when you can have grassy alpine single-track under your feet? The first control point is the start of the race. Check in with the volunteers, and make sure you’re ready to show the mandatory equipment. Your gear will be checked. Much of the route is remote. Be prepared for mountain weather, and bring plenty of your favorite snacks. Save some energy for Col Jorat. It’s a tough push, right after the village of Mex. Bring plenty of water for this next stage. Don’t miss the dinner after. It’s cool, everyone’s having fun, and there’s great video footage of the day. If you’re still around the area the next morning, treat yourself to the Val D’illiez Thermes Parc. Hey: you earned it, right?